Choose a full-time vein specialist for the best outcome. For most of his career, Carmen Putrelo was the assistant controller of an insurance company, where he sat behind a desk to perform his accounting duties. Little did the Upstate New York native realize, but his years of sitting had an adverse effect on his legs. The resulting discomfort peaked in late 2017, prompting a trip to his family physician. Carmen is happy that his dog Bella can sit in his lap again. 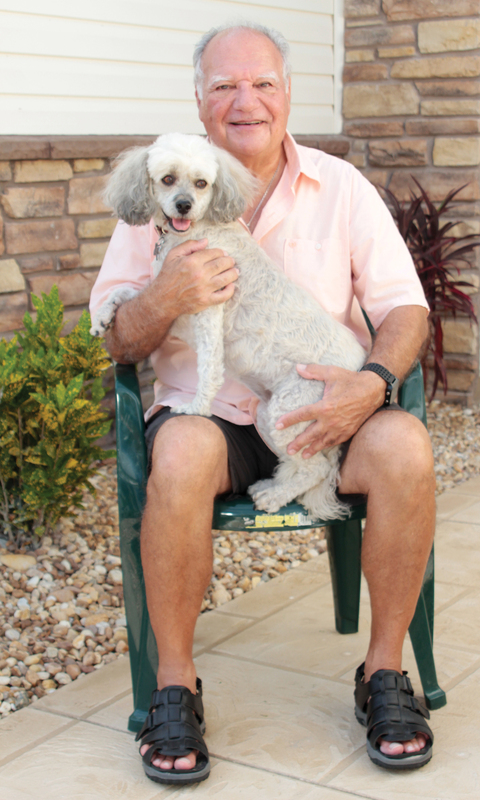 “There was dull pain in my left leg almost constantly,” he describes. “I have a very loveable dog that likes to lie on my lap, but I couldn’t let her because it would really hurt. More often than not, by the end of the day, my legs felt heavy and fatigued. They were uncomfortable and tired, like I just ran a marathon. When Carmen agreed to visit a specialist, his doctor recommended Ravi Sharma, MD, a board-certified cardiovascular surgeon with expertise in blood vessel disorders of the legs. Premier Vein Centers, Dr. Sharma’s practice, has offices in Homosassa and The Villages. Dr. Sharma has extensive expertise treating vein disorders. As a cardiovascular surgeon, he spent many years working with the intricate blood vessels surrounding the heart. Now, he focuses his practice full-time on treating patients with venous disease. Carmen was instantly impressed by the experienced surgeon. “Dr. Sharma told me how he was a cardiovascular surgeon but does nothing but leg vein work now,” relates Carmen. “I found him very genuine, and I felt he really knew what he was talking about. He described the process he uses to identify and correct leg vein issues. The vein surgeon also told Carmen that as people age, their veins stretch, enlarge and fail to compress as effectively as needed to move blood efficiently. In addition, the one-way valves in the veins weaken and leak, and the system of returning blood to the heart becomes inadequate. Leaking blood pools in the legs, causing pain, heaviness and other symptoms. The condition that results in weakened and leaking valves is called venous insufficiency. Using ultrasound imaging, Dr. Sharma confirmed that Carmen had venous insufficiency in both legs. About a week after Dr. Sharma completed the first procedure, he performed a second ultrasound on Carmen’s treated vein to ensure complete closure. He then moved on to the next vein. Preachers never retire. Neither do their wives. 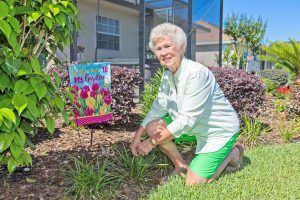 Mary Jim Campbell, 78, has assisted her husband in building churches in many states, including Florida. A few years ago, Mary Jim and her husband returned to Florida and settled in Summerfield. Soon after, they began a new church, where Mary Jim’s husband continues to minister. Mary Jim had her own issues to deal with, however. For one, she had a bulging varicose vein on her left calf. She’s had it for many years, but it never really concerned her. It bulged, but because of its location on her leg, it was barely visible. conscious about the highly visible veins and considered having that leg treated. “After we moved to Florida, a vein popped out on my right thigh and started crossing over my kneecap,” she confirms. “It was very unsightly. Of course, in Florida, I was wearing shorts more, and it felt like everybody was noticing it. I had a little swelling in my legs as well, and some painful leg cramps. Mary Jim’s desire to seek treatment for her leg vein issues led her to Dr. Sharma. She was amazed by what she learned from the acclaimed cardiovascular surgeon. Through the use of ultrasound images, which he obtained after learning of her health history, Dr. Sharma diagnosed Mary Jim with venous insufficiency. The doctor recommended several procedures to address her condition. The human circulatory system is composed of an intricate series of blood vessels. Veins are the blood vessels that return oxygen-depleted blood back to the heart. There are three types of veins: superficial veins, deep veins and perforating veins. Superficial veins lie close to the skin, deep veins lie in groups of muscles, and perforating veins connect the superficial veins to the deep veins. Venous insufficiency has many signs and symptoms, the doctor adds. Signs are the issues that can be seen, such as bulging varicose veins, swelling, and thickening and discoloration of the skin of the ankles or legs. Symptoms are those things that are felt but not seen. They include throbbing, aching, stinging, burning, itching, heaviness, nighttime leg cramps and restless legs. These are all indications that the veins are not functioning properly. Venous insufficiency is more common than many people think, notes Dr. Sharma. It is estimated that more than 30 million Americans suffer with symptomatic venous insufficiency. Venous vascular disease is five times as prevalent as peripheral arterial disease, or PAD, and more than two times as prevalent as coronary artery disease. “A huge problem with getting venous insufficiency properly treated is that many of its symptoms are invisible and often misunderstood by patients,” points out Dr. Sharma. “One of those symptoms is leg pain. Pain is common with many disorders, so venous insufficiency is often overlooked or misdiagnosed. “Patients and physicians alike need to understand that vein problems are often present before they are visible on the surface. Symptoms such as pain, heaviness and restless legs can signal vein disease without the corresponding visible varicose veins. With the right diagnosis, a patient’s leg pain can be relieved with simple, minimally invasive techniques. A full range of advanced, minimally invasive treatment options for addressing varicose and spider veins is available at Premier Vein Centers. These treatment options include microphlebectomy, endovenous laser ablation (EVLA), sclerosing injections and the new, non-thermal procedure, VenaSeal™. 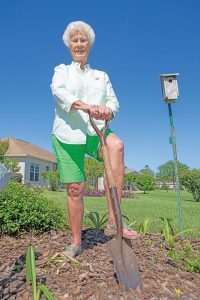 Microphlebectomy has replaced stripping, an outdated, more involved procedure in which doctors treated the large veins by making big gashes across the leg that often left the patient with large scars. During endovenous laser ablation, a sterile laser fiber is introduced into the incompetent vein via a small puncture in the leg. Laser energy is then delivered through the fiber, painlessly closing the vein in less than an hour, using local anesthesia. Sclerosing injections are used to treat spider veins, which are tiny, dilated blood vessels in the skin that become swollen with stagnant blood. Dr. Sharma uses ultrasound-guided sclerotherapy (UGS) to guide the injections that gently close the problem vessels. VenaSeal is a non-thermal procedure using a proprietary medical adhesive delivered endovenously to close the vein. This procedure has benefits such as not requiring multiple needle sticks and, in some cases, not needing to wear support stockings, as well as other benefits. Dr. Sharma uses his expertise to determine which procedures to use based on each patient’s symptoms and health status. These advanced treatments are all performed in a comfortable office setting and result in little or no downtime and discomfort. Premier Vein Centers provide a free initial consultation and accept most insurance, including Medicare. Mary Jim was impressed with Dr. Sharma’s expertise. She was also intrigued with the treatments she received at Premier Vein Centers, where Dr. Sharma addressed her venous insufficiency by employing a trio of procedures. Mary Jim is no longer concerned about wearing shorts. “I had laser ablation, microphlebectomy and sclerotherapy, and I was amazed by how little pain was involved,” marvels Mary Jim. “During one procedure, Dr. Sharma actually took out a piece of my vein and showed it to me. It was fascinating. Carmen was also amazed that the procedures to seal his leaking veins, as well as the recovery afterward, were easy and relatively painless. Mary Jim credits Dr. Sharma and his staff with making her experiences a positive one. They even let her husband sit in on one of the procedures. She was truly pleased with the ease of the procedures and very happy with the results. 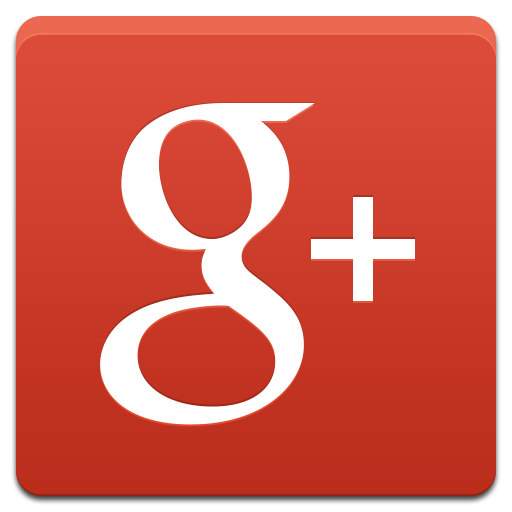 “I can’t say enough about the thoroughness and friendliness of Dr. Sharma and his staff,” states Mary Jim. “They told me what they were doing when they did the procedures. There was no fear involved, and I was very comfortable. I felt very confident in what Dr. Sharma was doing. Carmen is pleased with the results he achieved as well. Without the discomfort in his legs, he can allow his dog to sit on his lap again, and at the end of the day, he no longer feels like he just ran more than 26 miles. Carmen is also delighted he doesn’t have large scars on his legs from the procedures. “It’s incredible,” he enthuses. “I have no more pain in my legs. I feel like I have brand-new legs. If Dr. Sharma could only do that for the rest of my body, I’d really be happy! “I also don’t have that uncomfortable heaviness and tired feeling in my legs anymore, and I’m walking more now than I ever have. I have absolutely no problems whatsoever with my legs after walking. 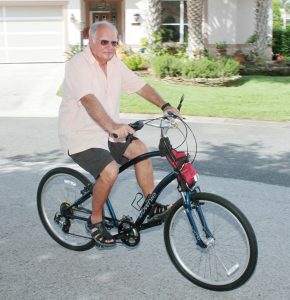 I also ride my bike and play golf and have no issues with my legs after the fact. According to Mary Jim, the caring, comforting treatment she received in the operating suite is given everywhere at Premier Vein Centers. Because of the inviting atmosphere, Mary Jim says she actually enjoys her visits there, which is not typically the case with her doctor appointments. “I don’t go to the doctor unless it’s necessary,” she emphasizes. “But with Premier Vein Centers, I look forward to going there. Dr. Sharma and his staff are friendly and happy. They create a family type of environment.